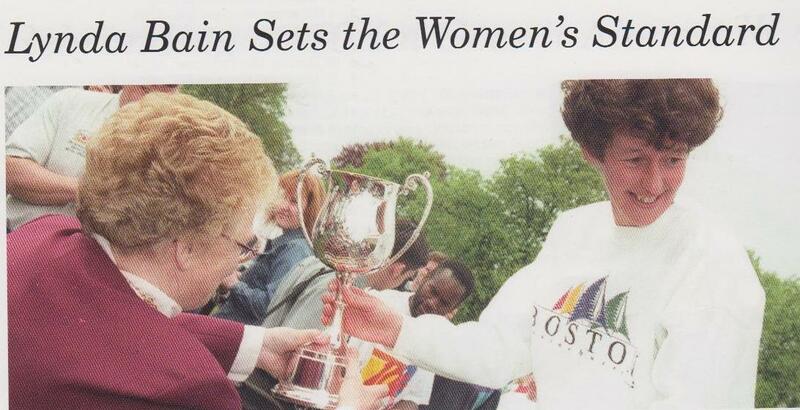 An official Women’s championship was created in 1983 and incorporated within that year’s City of Aberdeen marathon. While the venue for the Men’s championship moved around the country, the women’s event was held in the Granite City from its inception until 1990. The full history of Scottish women’s marathon running can, however, be traced back to the 1960s when Paisley’s Dale Greig was the trailblazer. The IAAF recognises her 3.27.45 performance on the Isle of Wight in 1964 as the first official ‘World Best’ time by a woman over an accurately measured and accredited marathon course. There were complaints at the time, however, as the Southern Counties AAA reprimanded course organisers for allowing Greig to take part. Ten years later, in Paris, Dale contributed to another piece of Scottish marathon running history when she collected a winner’s medal in the World Veteran Marathon Championships. The men’s title went to Aberdeen’s Alastair Wood and the race itself marked the first occasion on which men and women were officially allowed to compete together. Lynda Bain was the first recipient of the Scottish women’s title. The quietly-spoken librarian only took up running in 1981 but soon developed into one of the country’s finest distance runners. Her first marathon (under her maiden name of Lynda Stott) at Aberdeen in September 1981 was run in gale force winds, with driving rain making conditions almost unbearable. Bain showed great resilience in coming home third (3.21.12) behind Katie Fitzgibbon (3.07.46) and Priscilla Welch (3.08.55). 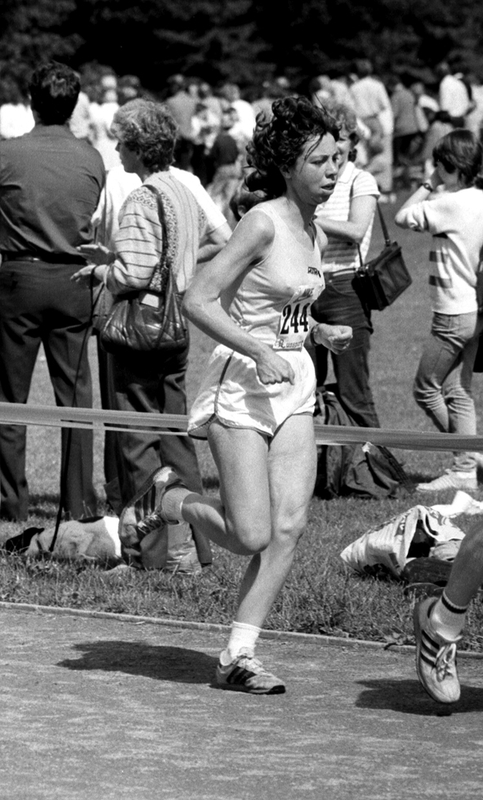 The North-East woman was quickly captivated by the challenge of the marathon, and ran another six races before returning to Aberdeen in September 1983 to collect her first national title, clocking 2.50.29 to defeat Welsh athlete Jacqui Hulbert (2.56.20) and Aberdeen AAC club-mate Morag Taggart (3.07.08). New York based Inez McLean topped the women’s rankings in 1983 with a 2.42.42 performance in the Big Apple while Leslie Watson clocked 2.45.47 at London. 1983 was the centenary of the Scottish Amateur Athletic Association, and special medals were struck for the occasion. The Track and Field Championships were held along with the marathon. On 18th June, the long distance lads prepared to tackle a similar course to 1981, but with the Cramond loop reversed, which made it seem hillier. Once again every expense had been spared and there were fewer marshals to help. Colin Youngson was quite fit and reckoned he had a good chance of picking up one of these special medals. A gold one would allow him to equal Joe McGhee’s three-in-a-row. However good fortune is needed in a marathon – so much can go wrong! His rivals were these two hard-training up-and-coming Scottish Internationals, Peter Wilson and Evan Cameron. Before the race, Youngson felt a little sick, but put it down to nerves. The weather was very, very hot indeed. Youngson went off fairly fast, and found himself alone. There wasn’t much of a wind, so he pushed away from the pack and built up a good lead – thirty seconds by five miles. However by eight miles his nightmare began – this was to be the pit-stop marathon. Despite having to stop three times, by eighteen miles he was still eighty seconds ahead, but another three desperate halts were required by 22 miles. When you’re in the lead in a marathon, you’ve got to keep going under any circumstances – and these were horribly unique. An extra-embarrassing detail was that the lead motor-biker inexplicably chose to cruise a hundred yards behind the leader! Dehydrated and exhausted, Youngson could not muster any fighting spirit when his club-mate Peter Wilson, who had paced himself well and, sensing victory, had closed rapidly, strode past strongly and went right away. Feeling really bad, physically and psychologically, Youngson plodded in, swearing that if he had to suffer like this again, he would give up marathons completely. Was it too much carbo-loading? No, just a badly-timed stomach bug. And it never happened again. Peter Wilson added further information. Apparently water stations were not available, as they should have been, during the last few hot hilly miles. Not realising he was well ahead and could ease up, Peter speeded up even more as he entered the stadium, sure that he had been told that there were only another hundred yards to go. An official sternly ordered him to complete another lap! Wilson struggled round one more and stopped dead at the line. Then another man in a blazer (a person with the same initials as Bad Guy, and infamous for trying to disqualify athletes on any flimsy excuse) spotted that Peter was wearing an official Aberdeen AAC vest which had a small sponsor’s mark in one corner. “What is this, then?” barked the officious one, repeatedly prodding the logo on Peter’s chest. Understandably, the exhausted runner became angry and suggested emphatically that his attacker back off. This he did; but some time later Wilson received a letter from the SAAA, insisting that he be more pleasant to their officials in future! Surely only politeness deserves politeness? The result was: first Peter Wilson (Aberdeen AAC – 2.26.20); second Colin Youngson (Aberdeen AAC – 2.28.46); third Evan Cameron (Edinburgh Southern Harriers – 2.29.30); and fourth Brian Carty (unattached – 2.33.45). Peter Wilson, now a successful Osteopath and Physiotherapist, but then a 27 year old scientific officer at Aberdeen’s Macaulay Institute for Soil Research, was an ex-hockey player who had only been running seriously for three years by 1983. An article about him stated ‘Peter’s weekly training regime is a study in self-imposed torture that would leave the Marquis de Sade drooling’! Every weekday lunchtime, he ran ten miles in 55-60 minutes, followed by another five before his well-earned tea. Add Sunday twenty milers, long repetitions and hill-work, and Peter’s reputation as a difficult man to train with was explained. He was also a good cyclist and a competent swimmer, and this cross-training turned him into a successful triathlete. Sunday 11th September 1983 was the date of the second Scottish People’s Marathon in Glasgow. This was given extensive live coverage on BBC Television. Amazingly, 9500 started the race. The irrepressible Jimmy Savile, surrounded by the invited runners just before the gun went, commented, ‘I suppose you’re wondering why I asked you all to meet me here!’ A leading pack of eighteen formed after a fast start, and stayed together for many miles since the day was cold and breezy. Eventually it broke up when runners snaked through the narrow tarmac paths of Bellahouston Park and Peter Fleming of Scotland broke away for a victory which delighted local spectators, reaching Glasgow Green in 2.17.48. Second was Bill Domoney of England (2.18.21); third Dic Evans of Wales (2.18.26); fourth Colin Youngson of Scotland (2.19.18); fifth Mick Crowell of Wales (2.19.20); sixth Andy Daly of Scotland (2.19.30); seventh Donald Macgregor (2.19.34); and eighth Malcolm McBride of Northern Ireland (2.19.52). The team race was won by Scotland, defeating Wales, the auld enemy England, Northern Ireland and Eire. Back in 1973, only 32 Scots finished a marathon under 2.50; in this one event, no less than 169 Scots achieved the feat! A week after Glasgow, the City of Aberdeen Milk Marathon took place, attracting 1300 competitors. Conditions were not ideal, due to a gusty wind, which exhausted Graham Laing when he tried to race right away from the field and stay there to the finish. The pack, two minutes behind at halfway, took turns to shelter, and eventually passed Laing who was forced to give up around twenty miles. Kevin Johnson of England won the race in 2.19.01, with Peter Wilson (Aberdeen and Scotland) first Scot in sixth place (2.21.53). Dave Clark, expatriate Aberdonian, and a meticulous planner who brought a scientific approach to marathon racing, demonstrated his status as a world-class veteran by winning the over-40 Masters age group in the New York marathon – in 2.17.30. Dave went on to have similar success in Boston and London, as well as winning the World Veterans 25 kilometres championship. The Marathon Boom had really exploded in Scotland by now. At least eleven races were available in the eighties: Aberdeen, Dundee, Glasgow, Edinburgh, SAAA, Inverclyde, Lochaber, Black Isle, Caithness, Moray and Loch Rannoch. Those were the days! 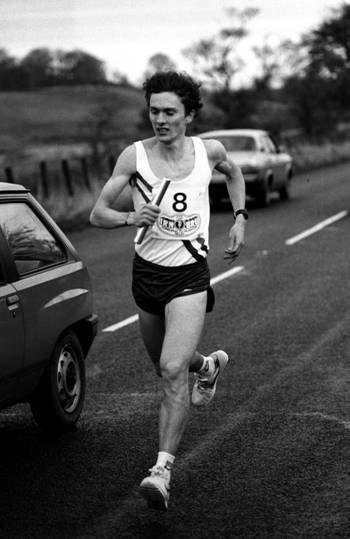 1984 was a good year for Lindsay Robertson, the hard-training, clean-living runner from Edinburgh Athletic Club. He started the year by finishing an excellent 6th in the hilly and very competitive International Barcelona Marathon. His time was 2.16.15. 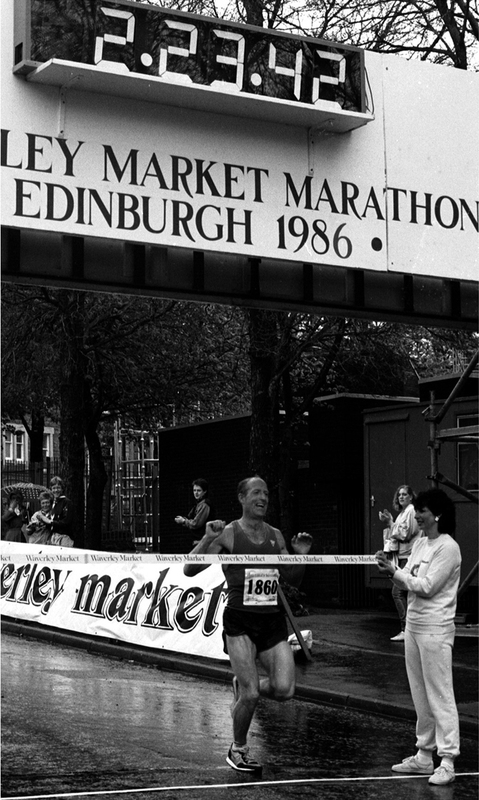 A winning performance in the Edinburgh Waverley Market Marathon reduced his personal best to 2.15.55, with Evan Cameron, a 1983 Scottish International cross-country runner, in second place breaking the 2.20 barrier in 2.19.34. The Scottish Marathon Championship in 1984 was to be included in the City of Aberdeen Milk Marathon on 16th September. This also featured an International contest between three-man teams from England, Scotland, Northern Ireland and Eire. The Scottish team was: George Reynolds from Aberdeen AAC and the RAF; Charlie Haskett of Dundee Hawkhill, a Scottish Cross-Country International who lived in Aberdeen; and Colin Youngson of Aberdeen AAC. Fortunately for these three, it was decided that SAAA medals should be reserved for Scottish finishers only. A record 2400 entered the race. Mick Walsh of Eire set a fast pace, but a chasing pack of Mark Burnhope, Alan Catley and Colin Brown (England), plus the three Scots, kept him in sight and overtook him eventually. This group broke up on the steep descent of Milltimber Brae at 16 miles, and the race quickly developed into a struggle between 24 year old Mark Burnhope, 23 year old George Reynolds and Charlie Haskett. By 21 miles, the Englishman began to stride away on his own down the South Deeside Road and then past the Duthie Park all the way back to the Beach Boulevard finish. There were some good battles for the minor placings, but the English team came in first (Mark Burnhope 2.19.36), a fast-finishing third (Alan Catley 2.21.09) and fifth (Colin Brown 2.22.37). This meant that the SAAA medallists were: gold – George Reynolds second in 2.21.04; silver – Charlie Haskett fourth in 2.21.37; and bronze – Colin Youngson sixth in 2.23.36. Don Ritchie was ninth in 2.26.35. England won the team race by three points from Scotland. 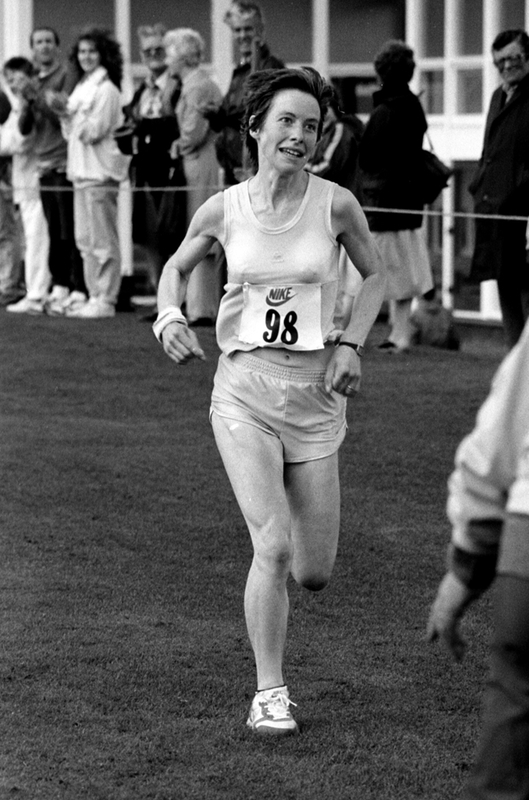 Aberdeen’s Lynda Bain made a rapid start in 1984 to defend her Scottish Women’s Marathon Championship, and hung on well to retain the title, taking three minutes off Leslie Watson’s Scottish Native Record with her time of 2.41.42. Margaret Baillie of Fife AAC was second in 3.00.57 and Morag Taggart of Pitreavie AAC third in 3.10.03. In 1984, Lynda Bain also represented Great Britain in the prestigious Kosice Marathon. George Reynolds, originally from Kinloch Rannoch, was at one time based at RAF Kinloss, but had moved south to Lincolnshire, where he worked as an aircraft techician. George, with a personal best of 2.20.40, had trained heavily for London in 1984, after finishing 12th in the tough RAF Cross-Country Championships. For twelve weeks (four weeks build-up, four intense, four taper down) he had run as many as 125 miles in a week, including a three hour Sunday run. However this recipe had not produced the desired result, since after a fast start he had slowed, especially in the last three miles, to 2.28. Like many others, he had learnt that more does not necessarily mean better. Consequently he altered his plan for Aberdeen. After a good third place in the seven-day Tour of Tameside, he started a nine-week regime (three weeks build-up, three intense, three taper). In total contrast to his pre-London system, he decided to reduce the weekly mileage to 75-80, and concentrated on speed-work. Sunday runs (24 miles) might be on his own or with friends from Grimsby Harriers. The reduced mileage gave him a feeling of speed in the legs, even after a long run. Unfortunately, since the base was preparing for a big flying service in Cyprus, he had to work 12 hour shifts around the clock, and became physically and psychologically low. This ended in the most pleasant way when, just one week before Aberdeen, the SAAA eventually got round to inviting him to represent Scotland in the Home International. George was delighted, and revived immediately. The night before the race, George tried out his splendid new Scotland strip and tracksuit, and checked his faithful Asics Tiger Jayhawk racing shoes for comfort. He slept well despite constantly thinking about the race next day. He remembered nervously chatting to rivals before the event, and the unusual weather for Aberdeen – no wind, sunny and warm. At seven miles, going up a near-deserted Union Street, he enjoyed a solitary piper blowing tuneful encouragement to the Scots in particular. There was to be a piper at every single mile marker on the route! It was a surge by Charlie Haskett after fifteen miles which began to split the group. However on the South Deeside road at twenty miles, George and Charlie heard the fateful patter of large English feet, as Mark Burnhope loomed alongside and before long moved away to victory. George was left, isolated and vulnerable, to survive the final miles, gradually tiring and worrying about losing second place. He only looked over his shoulder in the home straight, didn’t spot the sprinting Alan Catley, and was relieved to hold his place. His mother, brother Alick and girlfriend Ingrid rushed over to congratulate him. It was an extra pleasure to realise that he had won the SAAA Championship Marathon. Just one week later he ran the Humber Marathon from Hull to Grimsby, and amazingly won the event in 2.22.38, winning a trip to the New York City Marathon. George eventually gave up competition in 1994, but continued running twenty miles a week, and saw old friends or foes at Highland Games. He attended these events as an expert on the bagpipes. 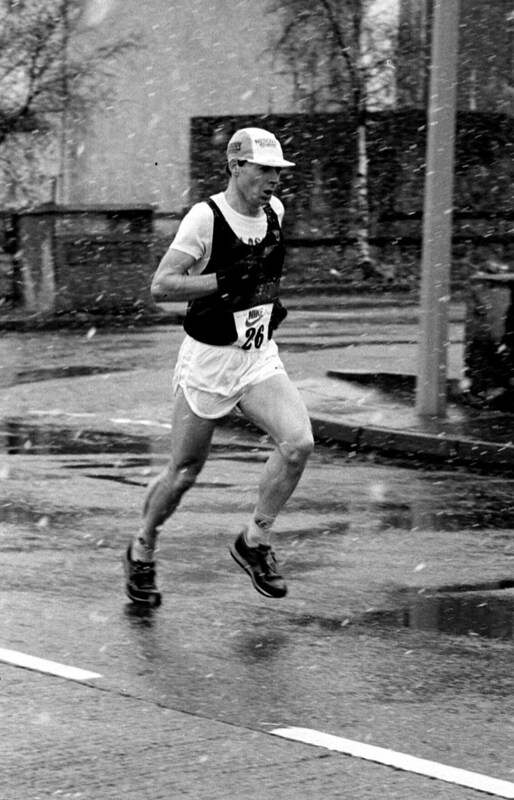 The 1984 Scottish rankings were headed by Fraser Clyne (Aberdeen AAC), who rounded off the year in brilliant style when, on the second of December, he ran a lifetime best in finishing second in the United States Championship marathon in Sacramento. He finished 26 seconds behind Ken Martin to record 2.11.49 which placed him third on the Scottish All-time list. Fraser felt fast and strong all the way – and was mainly delighted about finally beating Alastair Wood’s 1966 Aberdeen club record of 2.13.45! Fraser Clyne breaks the Aberdeen AAC marathon record! Other fast times in 1984 included John Graham (2.14.40); Lindsay Robertson (2.15.55); Lawrie Spence (2.16.01); Andy Girling (2.17.21); Andy Daly (2.18.01); Don Macgregor (2.18.16); Paul Kenney (2.18.28); Dave Clark (2.18.38); Charlie Haskett (2.18.41); Graham Getty (2.19.34); Evan Cameron (2.19.34); Murray McNaught (2.19.33); Alastair Macfarlane (2.19.56); and Don Ritchie (2.19.58). The London, Dundee or Glasgow marathons were the venues for most of these performances. 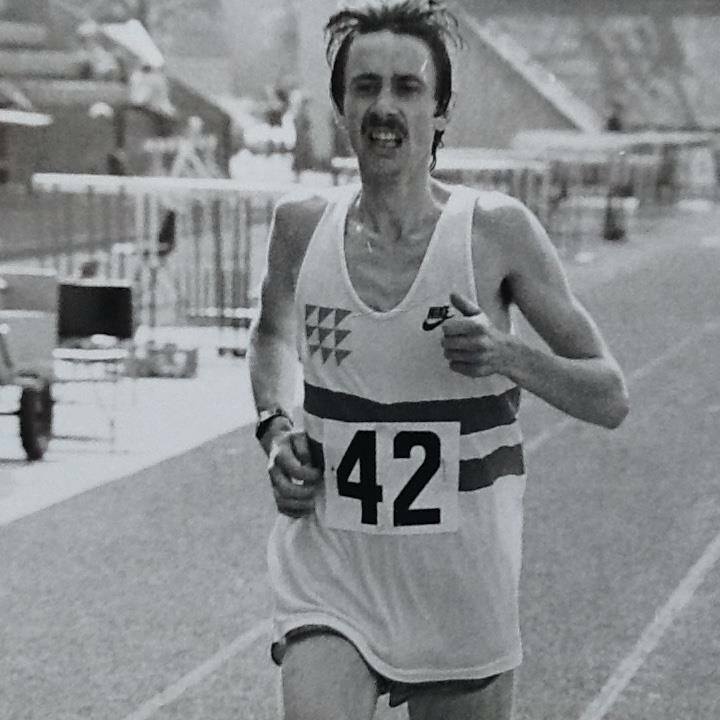 In 1985 the premier Scots performance was of course Allister Hutton’s fantastic time of 2.09.16 for third place in the London Marathon on 21st April. This is still the Scottish Record thirty years later. Allister’s most famous race was his 2.10.20 to win London after the most courageous early break in 1990. Never has there been more compulsive television! Andy Daly also ran a lifetime best in London 1985 – an excellent 2.15.47. The first Scottish marathon of the year was the 3rd City of Dundee People’s Health Marathon on 28th April. This took place on a day of chilly, sleet-laden westerly winds, which affected tactics. Eventually Murray McNaught (Fife AC) showed his stamina and good pacing by finishing very strongly, to win in 2.20.25 from Craig Ross (Dundee Hawkhill – 2.23.10) and Doug Hunter (EAC – 2.24.25). They were followed by Ian Graves (2.25.44); Charlie Haskett (2.26.06); Peter Wilson (2.26.31); and Don Ritchie (2.26.35 – only a week after running London). The 1985 SAAA Marathon was a doomed attempt to bring the event back as part of the Track and Field Championships. Firstly the police objected to a road race on a Saturday, so it had to be run on the morning of Sunday June 23rd. Secondly very few entries were received, due to the superior attraction of mass events and good prizes. In fact only eighteen competitors toed the line. Obviously, after this race, the SAAA Marathon would forever be reduced to a subordinate part of City or Country marathons around Scotland. 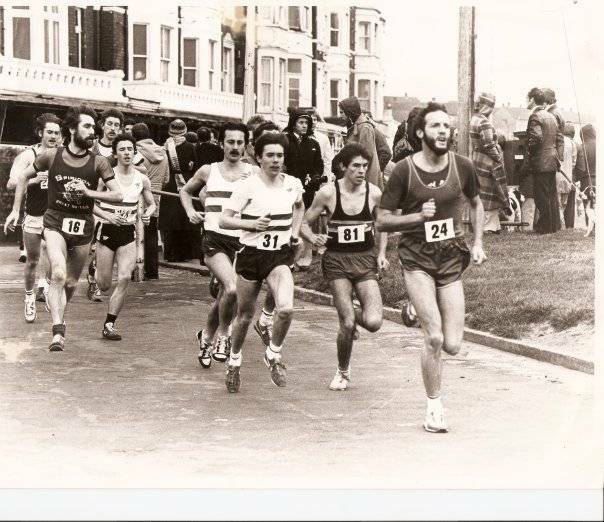 Nevertheless the leading group ran away briskly enough down to Portobello and into a strong headwind on what was meant to be the course for the 1986 Edinburgh Commonwealth marathon. A group of four went clear: Evan Cameron (ESH), Colin Youngson (Aberdeen AAC), Graham Getty (Bellahouston) and Pat McErlean (Aberdeen AAC). Indeed it was Pat, a 2.23 man who trained in Aberdeenshire with Youngson, who did most of the leading through three miles (15.52), although he had been dropped by seven seconds at five miles (26.29) and eventually slipped away. Even sharing the headwind and coping with a series of small hills was tiring. Ten miles was passed in 53.54 and by eleven miles, Graham Getty was off the pace. The turn was reached in 70.53 and, with the wind behind, the pace increased to 5.10 miling. Youngson hung on as best he could to Cameron’s determined running, but although Evan’s best was 2.19.34 and Colin had managed 2.19.22 in an April Dutch race, on this occasion the younger man was superior. After sixteen miles, Cameron ran a five minute mile and opened an increasing gap on Youngson. The leader passed 20 miles in 1.47.13, thirty seconds clear. After 22 miles, both suffered fatigue, and it was Getty who began to close slightly. At the finish, Evan Cameron was delighted to win the his first Scottish Championship in 2.22.49; with Colin Youngson collecting his tenth and last marathon medal in 2.23.46; and Graham Getty bronze in 2.24.13. Fourth was E. Walker (Livingstone and District) in 2.31.26. Each competitor received a jar of instant coffee! Sunday 15th September was the date of the 1985 City of Aberdeen Marathon, featuring an international contest between teams representing Scotland, England, Wales and ‘Rest of the World’! The latter included two Northern Irishmen and a Scotsman. Once again the police had stepped in and banned the fairly fast Aberdeen course, which had been replaced by a slower one. This looped round Union Street, Holburn, Duthie Park and the Harbour, up the Beach Promenade and away out the Tarves road, over to Dyce and back via Great Northern road to the Beach Boulevard. Dave Catlow of England was a clear winner in 2.22.54 from Colin Youngson (Scotland – 2.23.58); Mick Woods (World – 2.25.24); Dic Evans (Wales – 2.26.11); Richard Tough (England – 2.27.19); Doug Cowie (Scotland and the World – 2.27.59); Alan Jefferies (Wales – 2.28.55); Eddy Lee (Wales – 2.29.25); and Paul Wheller (England – 2.29.53). English-born Dr Ann Curtis (Scottish Hill Running Champion 1984-86) raced away with the 1985 Scottish Women’s Marathon title. First native Scot was Janine Robertson, who won a trip to New York in what was only her second marathon. In 1986, as usual, Dundee was the first Scottish city marathon of the year. On 27th April the winner was Colin Youngson (2.20.03) who got away from Murray McNaught on the big hill at nineteen miles, and came home a minute in front. 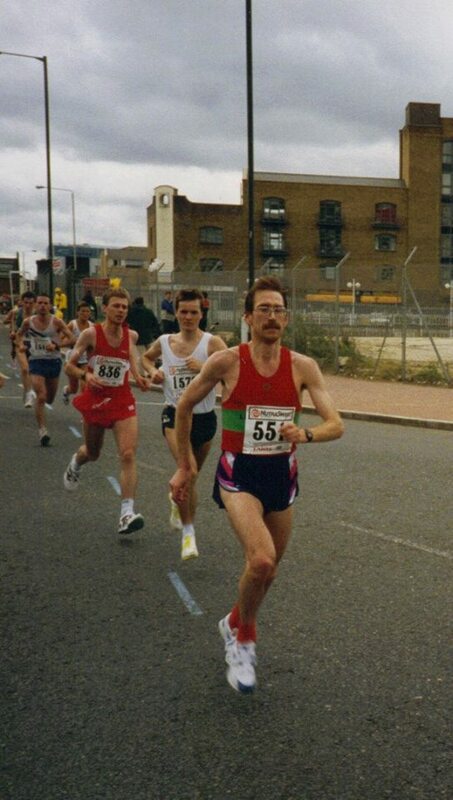 In the London Marathon, Aberdeen AAC’s Welsh International, Simon Axon, ran 2.19.33. 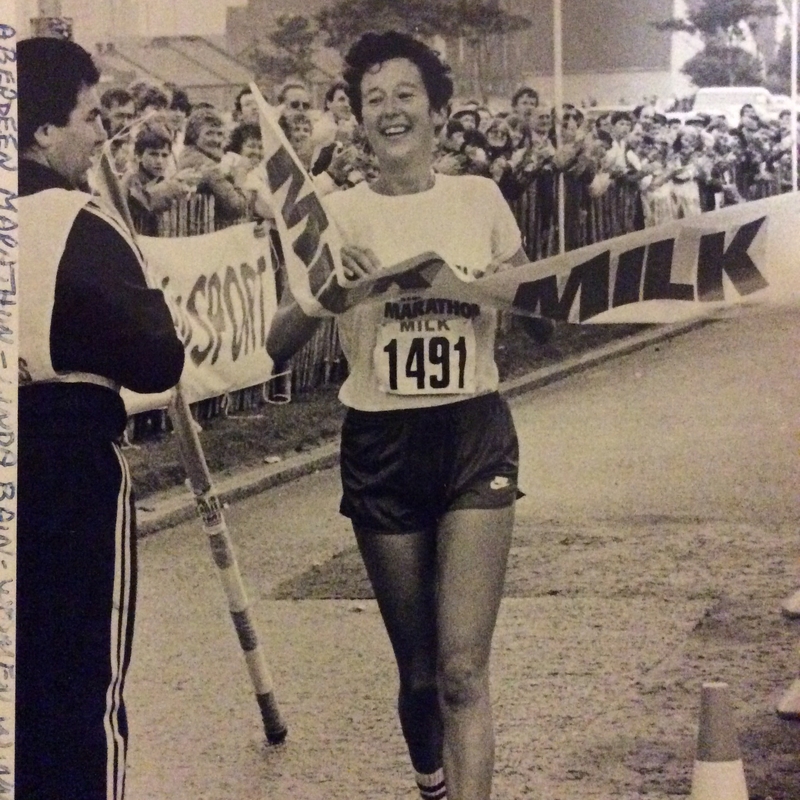 The 1986 Scottish Women’s Marathon title was contested on 25th May at the City of Aberdeen Milk Marathon. Stephanie Quirk, a 29 year-old physiotherapist, won the Scottish title, knocking nine minutes off her previous best. She was based in Kendal and enjoyed some success as a fell runner. She finished well clear of Janine Robertson and Morag Taggart, who pocketed her third championship bronze in four years. The 1986 SAAA Marathon was part of the Edinburgh Marathon which followed a tortuous route from outside Meadowbank, up to the Royal Mile, down Lothian Road, right along Princes Street and back to the start. Then it continued to Seafield, Cramond and back to Seafield before climbing up to the start/finish. The two Donalds: Macgregor (1965-1986) and Ritchie (1967-1988), hold the record for years between first and last medal in the event – 21 years, no less. On the 26th April, 1987, the City of Dundee Peoples Health Marathon hosted the Scottish Men’s Marathon Championship. Terry, Charlie and Sam were the SAAA gold, silver and bronze medallists. “The only problem was in the last six miles when I began to feel the pace a bit, but I got to the end okay,” said the victor. 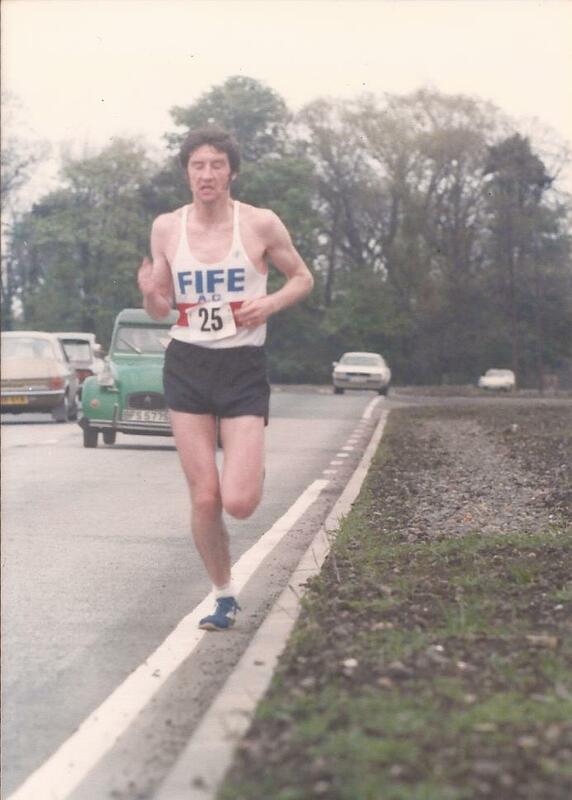 Sam Graves (formerly known as Ian) had enjoyed a long career with Dundee Hawkhill Harriers and Fife AC, racing well at all distances from 1500m to the marathon and beyond, in the Two Bridges 36 mile race. Also on 26th April, the Lochaber Marathon had featured a duel between two SAAA Marathon winners. Colin Youngson set out over-confidently, building up a two-minute lead by ten miles into what he thought was a headwind. However after the turn he discovered that there was another headwind to struggle into on the way back, and also that Brian Carty was pulling him in steadily. When Brian caught up at 22 miles, Colin assumed he was ‘dead and buried’ but Brian, true to form, started chatting pleasantly! Too knackered to respond in more than grunts, Colin dropped in behind for a bit of shelter. Just before 25 miles, he had recovered enough to make a last-ditch effort, ran very hard for half a mile and hung on desperately to the finish. Eighteen seconds later, a fresh Brian, such a genuinely nice guy, rolled in to congratulate Youngson who was panting helplessly against a wall. Colin’s 2.26.15 was a course record until Fraser Clyne raced Lochaber. On the 24th of May 1987, the City of Aberdeen Milk Marathon once more hosted the Scottish Women’s Marathon Championship. 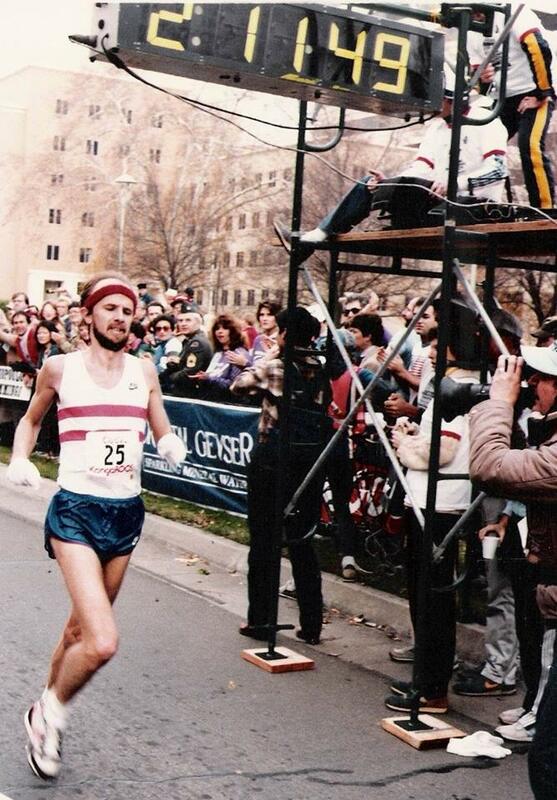 1987 was also the year when Lindsay Robertson of EAC reached his peak, recording 2.13.30 on October 25th. On 22nd May 1988, the Aberdeen event included the Scottish Women’s Marathon Championship. Fastest Scottish woman in the 1988 rankings was Heather McDuff, whose 2.34.26 was second all-time to Lynda Bain’s 2.33.38 in 1985. 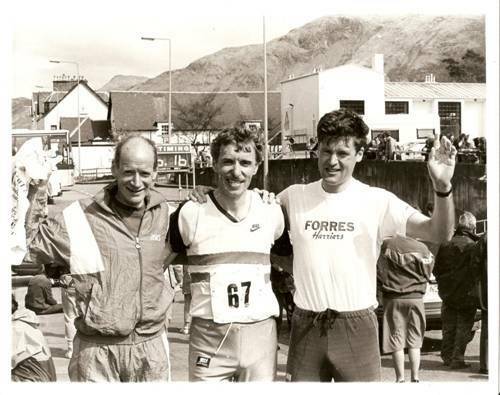 1988 was the year when the Men’s SAAA Marathon travelled to Fort William as part of the Lochaber race. Colin Martin, a Scottish Road-Running International in the seventies, had become a veteran the previous year. He and his Dumbarton training friend/rival Allan Adams (the 1989 British Veterans M45 Marathon champion at the Flying Fox event in Stone, Staffordshire, when he had also beaten all the M40 runners) had been doing 90 to 100 miles per week, with Tuesdays and Thursdays devoted to 400, 800 or even mile repetitions with Lachie Stewart and his promising son, Glen. Colin’s Saturday session might be 22 miles on the road, with Sundays an hour and a half over country trails. Lochaber made an excellent target, since it also hosted the Scottish Veterans and SAAA events. Don Ritchie wrote that on 24th April “a group of six runners formed by the time we left the town. I increased the pace and by the turn there were three of us left. At about 18 miles I managed to drop the Pitreavie runner McNeill, but Colin Martin stuck behind me.” Colin remembers that over the next few miles, both athletes made attempts to get rid of the other, to no avail. Shortly after the right turn at Corpach, on a stiff little climb starting at a garage, Colin burst away and held a narrow lead to the end. It was a very gruelling race indeed. The result was: first Colin Martin (Dumbarton AAC – 2.30.09); second Donald Ritchie (Forres Harriers – 2.30.26); third Bill McNeill (Pitreavie – 2.36.39). 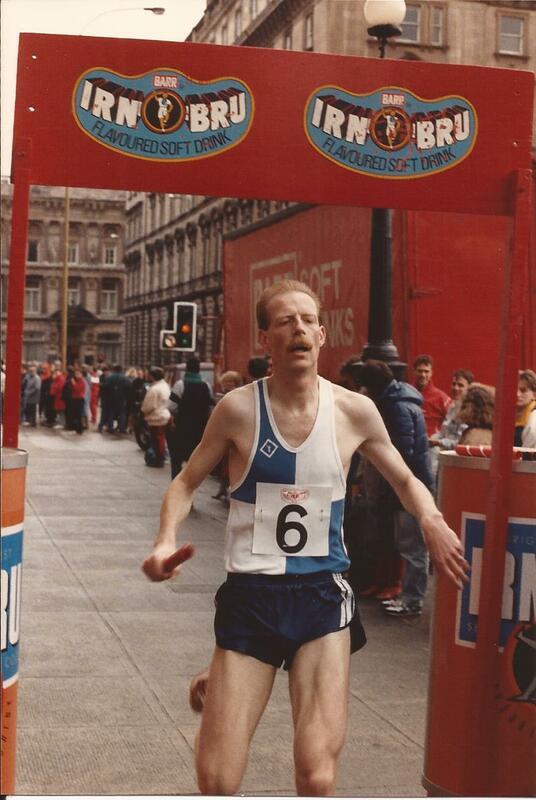 Colin Martin went on to represent Scotland in the Nuremberg Marathon in June 1988. 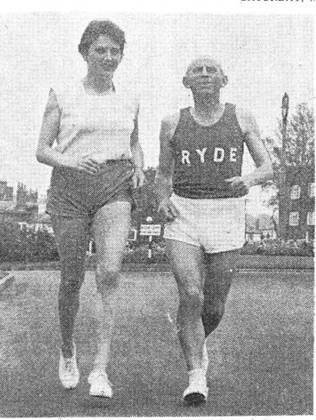 Donald Ritchie, of course, was the most famous Ultra-Distance Runner in Britain and, along with Yiannis Kouros, in the World. His normal training was 140 miles per week, including weekdays of 14 miles to work, and another 14 miles home. His Thursday run home might be 21 miles, with a steady 50 k on Sundays. However for a marathon he reduced this to a mere 120, adding effort sessions on Tuesdays and Thursdays. These might be either two or three minutes hard (with equal jog recoveries); or a pyramid session (one minute hard, one easy, two/two, three/three, four/four, five/four, four/three, three/two, two/one, one). A 1983 article mentions that he held at least eight world records. 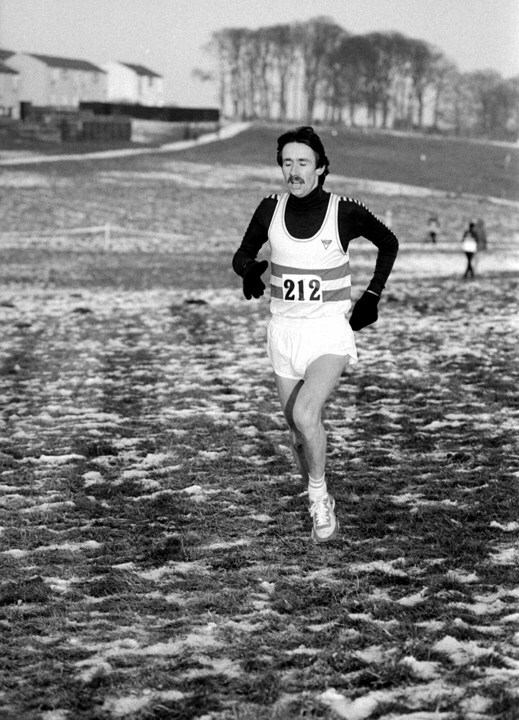 After several years of gradual improvement he won the Scottish Universities Cross-country title in 1972 and finished eleventh in the ‘National’. His ten-mile track time was reduced to 49.32. 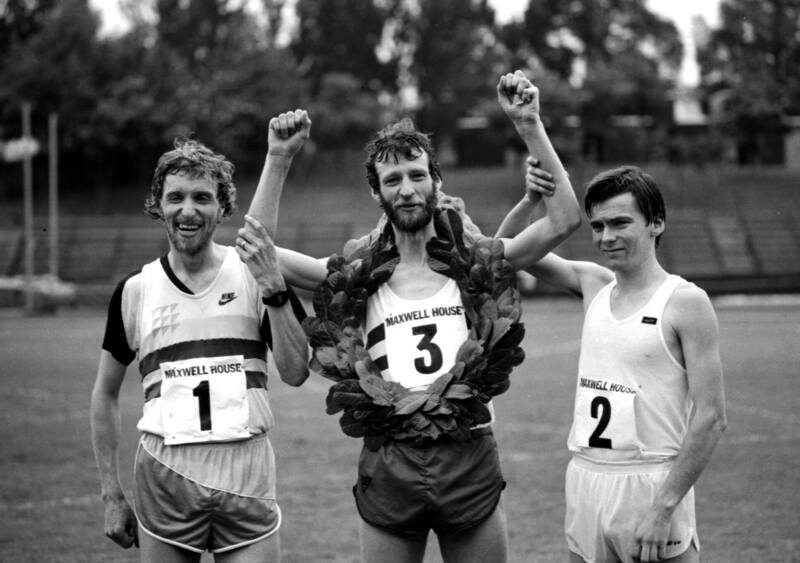 During a spell in Birmingham with Birchfield Harriers he trained with Ian Stewart and once almost beat Dave Moorcroft in the Warwickshire cross-country championships. After a second place in the London to Brighton ( a race he later won twice, including a course record), he began to set world records: 50k – 2.50.30; 40 miles – 3.48.34; 100k road – 6.18.00; 100k track – 6.10.20; 50 miles – 4.53.28; 150k track – 10.36.42; 100 miles track – 11.30.51; 100 miles road – 11.51.11. After becoming a veteran, he set countless age-group world records, and he also became the fastest runner between John o’Groats and Land’s End. Just think for a few moments about the best of these performances: probably the 100k track and the 100 miles track. Work out the average pace per mile. Consider the effort and toughness required. Absolutely amazing! In 1989 the Aberdeen Marathon doubled as the SAAA Championships, as well as a Home Countries International race. 225 runners took part and for the first time the title went to an English International athlete. On a cold windy day, a small pack stayed together until seven miles, when Ian Bloomfield of England, a 36-year-old local government officer from Chester-Le-Street in County Durham, made a break, accompanied by his team-mate Eric Williams. By half-way, Bloomfield was out on his own and Williams began to fade. 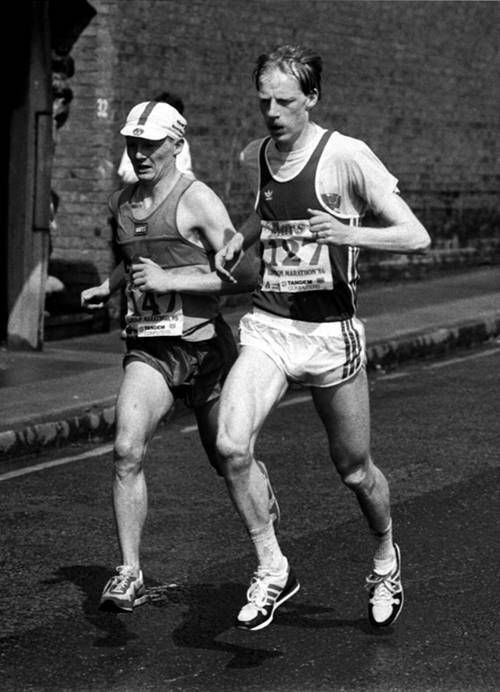 Terry Mitchell of Scotland and Mick McGeoch of Wales, making his sixth appearance in the Aberdeen race, shared second place until 22 miles, when Terry got away. Because of cramp, Mick struggled to hold off the fast-finishing Nigel Barlow. Ian Bloomfield made clear that it wasn’t the easiest of victories when he gasped afterwards, “It was tough, bloody tough!” after taking a severe buffeting from the strong north wind that battered many competitors into a state of near-submission. Ian Bloomfield (England) won in 2.22.30; from Terry Mitchell (S – 2.24.53), Mick McGeoch (W – 2.25.57), Nigel Barlow (E – 2.26.09), Rob Hall (S – 2.29.35), Arwell Lewis (W – 2.30.51), Colin Youngson (S – 2.31.29), David Bond (E – 2.32.24) and Eric Williams (E – 2.33.16). Liz Hughes (Aberystwyth), a 32-year-old university geography research officer from Wales, pocketed the Scottish Women’s Championship title in 2.54.24. That knocked twelve minutes off her previous best time, set when winning the Welsh title on her marathon debut at Bridgend in 1987. Aberdeen’s Margaret Stafford, third the previous year, clocked a personal best 3.06.36 for second place, while Inverurie’s Linda Trahan knocked 20 minutes off her previous best, set just four weeks earlier in Lochaber, to take third place in 3.14.42. Mick used to run up to 110 miles per week, with 22 miles on Sundays and a weekly session of track repetitions – either shorter efforts in summer or 600m-1000m in winter. This aspect of his training paid off when he won the British Veterans 5000m. 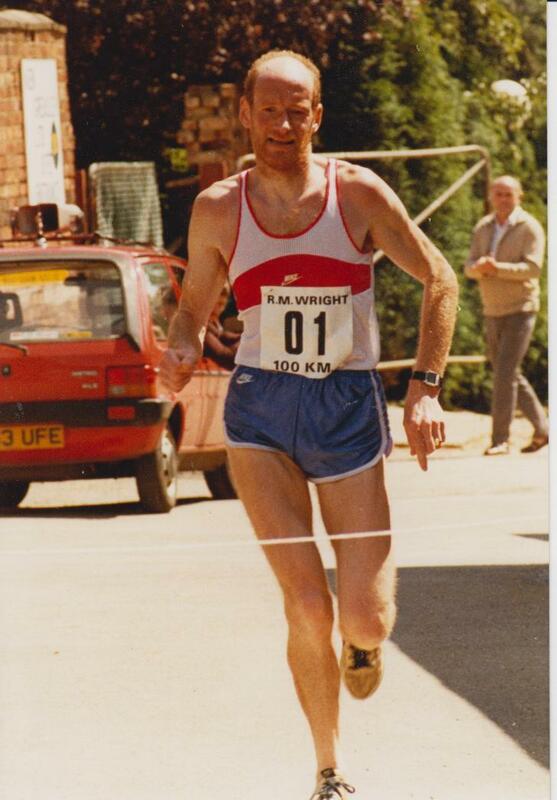 However in the eighties he was a successful Ultra runner – winning the Two Bridges (36 miles 365 yards), the Barry Track 40 miles and finishing third in the famous London to Brighton (53 miles 540 yards), as well as representing GB in the World 100km Championships. He helped to organise the Barry 40 and the Welsh Castles Relay. His club, Les Croupiers, was named after a Cardiff casino, and the owner (a former 2.28 man) sponsored them generously for many years. Mick personified the cavalier spirit which can flourish amongst runners; in Scotland we had Robin Thomas and Hunter’s Bog Trotters!